TL;DR Audience Overlap can be detrimental to achieving your Facebook campaign goals. This is because Facebook will use the audience with the better history and can cause you to waste your budget. Here are our Don'ts and Dos to avoid audience overlap. You don’t want to increase your own bids by letting your campaigns compete with each other. You don’t want to bore your audience with repetitive creatives. You don’t want to miss out on targeting people in different stages of the funnel. And you definitely don’t want to create a mix-up in your own campaign reports, which will happen if you have the same people in different target groups. When you create a lookalike audience, a part of the WCA can be included too – you need to exclude the WCA to avoid double-targeting. 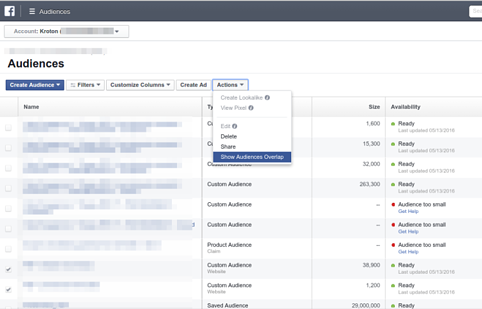 Facebook’s Audience Overlap tool allows you to compare up to five audiences in order to find the existing overlap percentage between them. It helps you see how many users were already in audience 1 that also sneaked into your audience number 2. 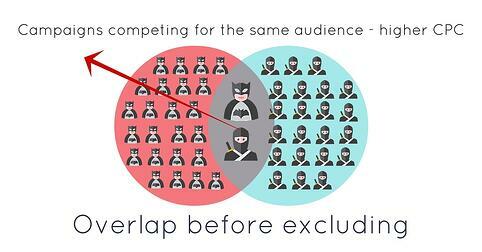 As long as individual audiences have over 1,000 users each, the Audience Overlap tool is the first step you should take towards untangling your possibly already mixed-up target segments. Since you can also compare across different audience types, you can create saved audiences with any characteristics, including interests or behavior, helping you improve your strategy for new customer acquisition. The creative potential for using Audience Overlap is endless, and we suggest you try out different options depending on your objectives. 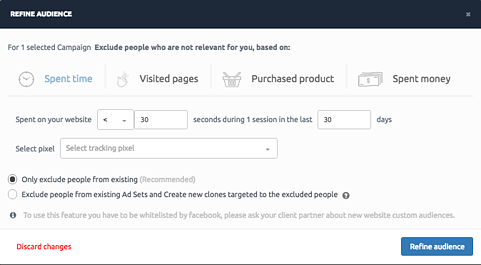 You can compare your converted customers to your Facebook fan base, or your new Lookalike to your existing targeting options. ► How to avoid overlap when you are creating more than one campaign using different lookalikes? The best solution is to define which one is the principal lookalike and exclude it from the new ones. ROI Hunter makes excluding audiences a seamless part of your campaign setup, allowing you to reach that perfectly refined audience every step of the way. To improve your campaigns today, try our Refine Audience tool: it divides audiences, preventing them from overlapping from the very start. You can also exclude interests, behaviors, qualified bounce traffic or even your own mailing list, in order to avoid sending the same message twice. 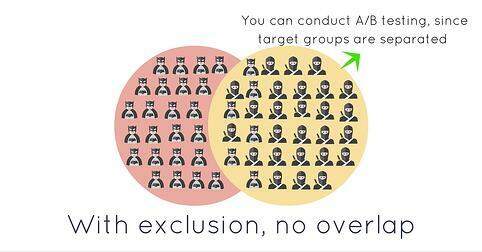 To set up your "un-overlapping" campaigns, try ROI Hunter today.